On the implementation chart for NC State’s new research administration system, campus training occupies a single box, positioned as the next-to-last step in a seven-part journey that progresses from process mapping to system launch. But like almost everything involved in rolling out the new centralized system, it’s not as simple as it seems. For one thing, campus training isn’t a one-time endeavor. The new system is divided into five modules, and each has its own implementation process, complete with user training. And there are different types of users — principal investigators, research administrators, compliance coordinators — with different needs, not to mention different learning styles. “If you’re not familiar with the industry of training development or human resource development, you don’t really understand the complexities,” says Lynley Wentzel, who joined the Office of Research and Innovation last fall to spearhead campus training for the new system. Wentzel, who is completing a doctorate in human resource development and training in the College of Education, has worked in the field for nearly 20 years, primarily as a trainer and instructional designer for health care organizations. She’s at home discussing the finer points of Kirkpatrick’s Four-Level Training Evaluation Model but also understands the cultural basis for human behavior thanks to an undergraduate degree in anthropology. 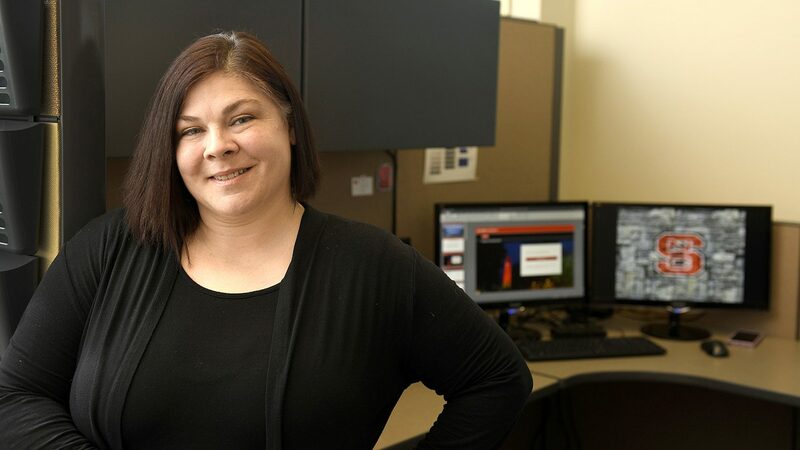 Wentzel is making good use of her training and experience as she builds the training program for the new system, dubbed Research Enterprise Data. NC State has licensed the system from industry leader InfoEd Global, whose integrated suite of software products has been used by colleges and universities for over two decades. Wentzel’s training plan goes into action in April to help users of the first module — animal care and use — make the switch to the new centralized system. The current process requires researchers to download forms from a website and then submit their paperwork to reviewers by email. Training will be delivered using a blended approach, with both e-learning and classroom sessions, as well as a training manual and quick reference guides. Some of the training will be conducted in computer labs on campus to provide what Wentzel calls “action-based experiential guided learning.” It’s the kind of hands-on training that allows users to enter and change data, generate and submit reports and complete many of the common tasks involved in managing a research project. For users who don’t attend a training class in person, e-learning modules will provide the same information without the hands-on experience. Some may opt to just read the manual.